“If You've Been Waiting… It's Time. Our good friend, Dr. David “Doc” Eifrig, wrote those words in his Retirement Millionaire newsletter this past October. Even though he is not a gold bug, he felt strongly enough about gold to reprint his article on December 27th. We agree with the good doctor. We believe it is time to get off the fence with respect to gold. 2019 should be a golden year. Needless to say, this past year was not kind to investors. Nearly every indicator we track was down year-on-year. The two holdouts from negative territory were the Japanese yen (just barely) and palladium (convincingly). For palladium, this is becoming the norm. In 2016, palladium was up 21% for the year. In 2017, palladium broke out to the tune of 54% for the year. Last year, palladium continued to build with another 21% gain… even surpassing gold in price for a few moments at the end of the year. Experts are mixed on whether or not palladium’s run is overdone. However, persistent supply shortages and the unlikeliness of auto manufacturers to switch back to palladium’s sister, platinum, at this time suggest palladium has some room yet to appreciate for the next few years. The final bright spot in 2018 was gold. Although it managed to lose 1.6% year-on-year, it showed incredible resilience in 2018. 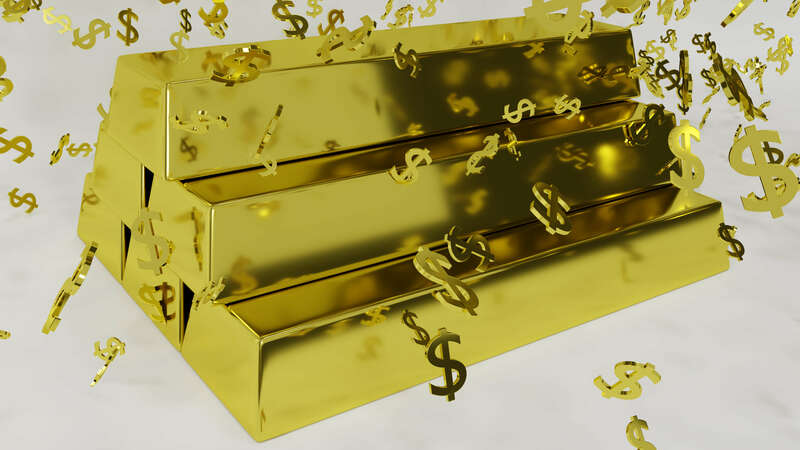 All year long, gold faced considerable headwinds from a strong U.S. dollar, the nearly decade-long equities bull market, considerable outflows from gold ETF’s, and a Federal Reserve determined to steadily raise interest rates. Yet, despite these significant pressures, gold surged 4.4% in December, 7.4% in the 4th Quarter, and managed to end the year basically flat. 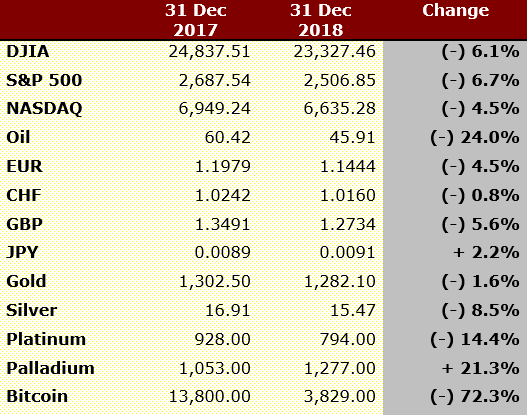 Gold has Central Bank buying (by China, Russia, Turkey, Kazakhstan, Poland, and others) and surging investor demand to thank for an arguably strong performance in 2018. By far, 2018’s biggest loser was Bitcoin. The lead cryptocurrency followed 2017’s 1,328% gains with a 72% loss as speculators ran for the exits. Make no mistake, those calling for Bitcoin to dethrone gold as the world’s only real money and safe haven of choice have gotten this completely wrong. This is not how wealth insurance behaves. Other disappointments in the past year were oil, platinum, and silver. They all depreciated more than the top U.S. equities indices. But, that being said, the Dow (down 6.1%), S&P 500 (down 6.7%), and NASDAQ (down 4.5%) are bigger disappointments. With their collapse in the 4th Quarter, all three indices moved, with astonishing speed, straight through correction and into bear market territory. There may still be a late stage rally, but it certainly appears that, after a decade, the bear has overtaken the bull. “Get Protection Now for Cheap. If gold is insurance, remember you need to buy your policy before the disaster. If you wait until the disaster is at hand, your premiums tend to go up. Let's recap... You want to own gold for safety... at least a little. It's a hedge for when the rest of your assets collapse. The times that it comes in handy – inflation, fear, and low interest rates – all look to be in the offing. Doc is a smart guy. As mentioned at the start, we agree with his assessment. We still believe, as we stated this time last year, that the dollar and debt are what you should focus upon to make sound investment decisions going forward. Debt will continue to unfold, and its impact will be felt. I firmly believe the smart money is buying gold right here… right now. In 2019, I don’t see a better way to Keep What’s Yours! Call us at 800-831-0007 or send us an email to set-up a consultation… now… today! Best wishes from all of us for a Happy, Healthy, Prosperous, and Golden New Year!